The March seas have struck again and stranded more than 100 passengers in Antigua on Wednesday, March 7. The Access Division had arranged for the passengers who had been stuck in Antigua since high seas caused cancellation of the ferry service on Sunday, to travel down and dock at Port Plymouth. However, the Jaden Sun was unable to dock at the port and a further attempt to dock in Little Bay had to be aborted as the waters were too rough. A total of 114 passengers were reportedly aboard and had to be taken back to Antigua pending a decision on how to get them to Montserrat. The island is expected an estimated 2000 people to arrive in the coming days to enjoy the annual St Patrick’s Festival which officially begins on Friday, March 9. The Honourable Premier Donaldson Romeo said on Wednesday afternoon on ZJB Radio that the decision to dock in Plymouth was not taken lightly and early morning indications had shown that it would be safe for the ferry to dock there. However, by the time the ferry arrived after noon, the surf had increased and made it unsafe to dock. Premier Romeo said the government has taken the responsibility to provide meals, transport and accommodations to the passengers, pending further plans. The Access Division announced late Wednesday that flight arrangements are being finalised for the elderly and children to be flown in on Thursday March 8, 2018. The seas are notoriously rough during this time of year. Last year on March 8, 2017, the Jaden Sun was forced to dock in Plymouth as the waters in Little Bay were too rough. 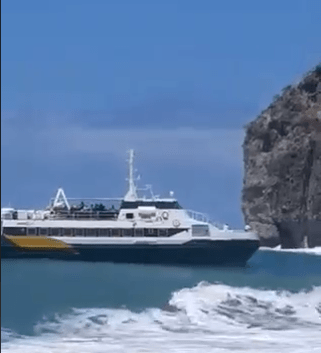 One of the calls on social media on Wednesday, was for the government to push for a breakwater as it would make a significant difference to the ferrying of passengers and ships.